At first glance, Canadian bacon looks a lot like ham. Some people might not even notice the difference, as Canadian bacon tastes quite similar to the common type of ham. Nonetheless, these two savory types of meat are more different than you think. In this article, we’ll uncover the details that differentiate one from the other, pertaining to where the meat comes from, the processes involved, and how they are commonly served. Canadian bacon is also called “back bacon.” It comes from the loin cut, which runs along the pig’s back. This type of meat is often prepared at home and is more popular in the United States than in any other part of the world. Canadian bacon is best served soft and juicy, and is usually eaten for breakfast. Ham comes from the leg, thigh, or rump of the pig. This meat is known all over the world and comes in different types such as the American ham, Spanish ham, or Chinese ham. Ham undergoes several stages of preparation, often with the help of mechanical processes, and can be bought ready-made in grocery stores or meat shops. The main difference between Canadian bacon and ham is that they are from different parts of the pig and have distinct textures. Canadian bacon, or back bacon, is from the loin while ham is from the leg, thigh, or rump. 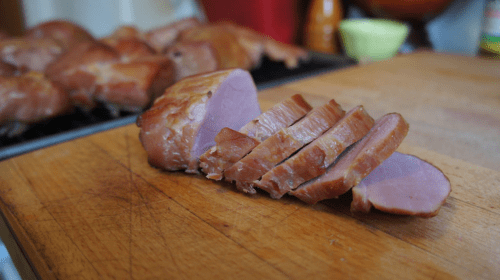 Canadian bacon is often prepared at home with the meat being cured, smoked or fully cooked, and sliced. Ham often goes through the industrial process of salting, curing, smoking, and cutting. There is usually only one type of Canadian bacon whereas there are many different types of ham. These types range from the all-American country ham to the Spanish Jamon Serrano to the Chinese type Jinhua ham. Canadian bacon is usually eaten during breakfast or brunch. It is served when soft and juicy and in sliced form only. 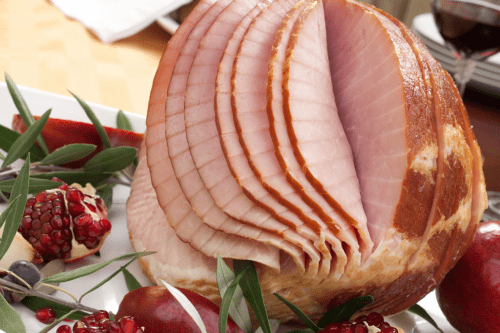 Ham, on the other hand, is eaten at any time of the day and can be served in regular slices, paper-thin slices, diced chunks, and as a whole. In terms of nutritional content, Canadian bacon has more protein than ham. Moreover, it also has lower carbohydrates and cholesterol and contains fewer calories than ham. Ham contains more vitamin C and calcium but has a higher sodium content than Canadian bacon.